Are you looking for a new boiler installation in Fife whether its Worcester, baxi, bosh, ideal or even vokera? LC Joinery Roofing and Building Work LTD has the knowledge and expertise to provide you with high quality boiler installations and we are also Gas Safe Registered. Do you need help choosing the right boiler for your property? Our plumber will attend your property and carry out a report which will determine the best boiler for you which will suit your needs and budget. 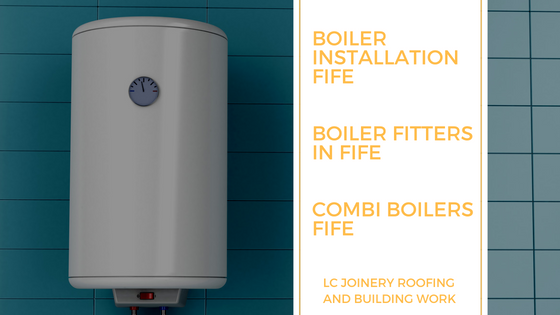 LC Joinery Roofing and Building Work LTD install high-efficiency gas boilers in homes across Fife including Kirkcaldy, Glenrothes, Burntisland, Aberdour, Kinghorn, Anstruther, Buchaven, Cardenden, Lochgelly, Kinglassie, Dalgety Bay, Dunfermline etc. We Install the boiler of your choice or choose one of our recommended gas boilers to suit the needs of your home. All our boilers come with a manufacturers guarantee and we can even get your boiler on finance to. Combi boilers are the most popular type of boiler in the UK. Providing heating and hot water on demand, without the need for a water tank or cylinder, they take up little space and don’t require a pump. They are suitable for most homes. They take water from the mains and heating it; combi boilers produce a continuous supply of water. By not storing hot water in a separate tank, combi boilers are more energy efficient than other types of boilers. We understand our customers need through our years of experience, our estimator is a fully qualified engineer. So what are you waiting for? Get in touch today for your new boiler! of installation in favor of other models.